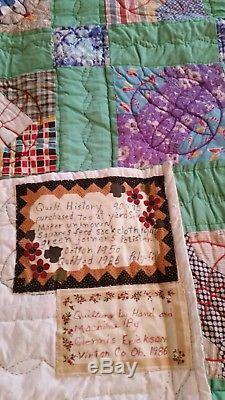 This very colorful light weight quilt has a very interesting history. 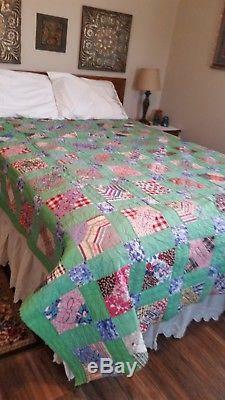 The primary pieces are made of very colorful feed-sack fabric with the blocks being hand-sewn and polyester green joiners added to complete the top. The batting is polyester fiber-fill. The item "Vintage colorful hand-made feed-sack quilt, 90x75, circa 1940-1986" is in sale since Thursday, March 15, 2018. This item is in the category "Collectibles\Linens & Textiles (1930-Now)\Quilts". The seller is "918carolyn" and is located in Broken Arrow, Oklahoma. This item can be shipped to United States, Canada, United Kingdom, Denmark, Romania, Slovakia, Bulgaria, Czech republic, Finland, Hungary, Latvia, Lithuania, Malta, Estonia, Australia, Greece, Portugal, Cyprus, Slovenia, Japan, China, Sweden, South Korea, Indonesia, Taiwan, Thailand, Belgium, France, Hong Kong, Ireland, Netherlands, Poland, Spain, Italy, Germany, Austria, Russian federation, Israel, Mexico, New Zealand, Philippines, Singapore, Switzerland, Norway, Saudi arabia, Ukraine, United arab emirates, Qatar, Kuwait, Bahrain, Croatia, Malaysia, Chile, Colombia, Costa rica, Panama, Trinidad and tobago, Guatemala, Honduras, Jamaica.